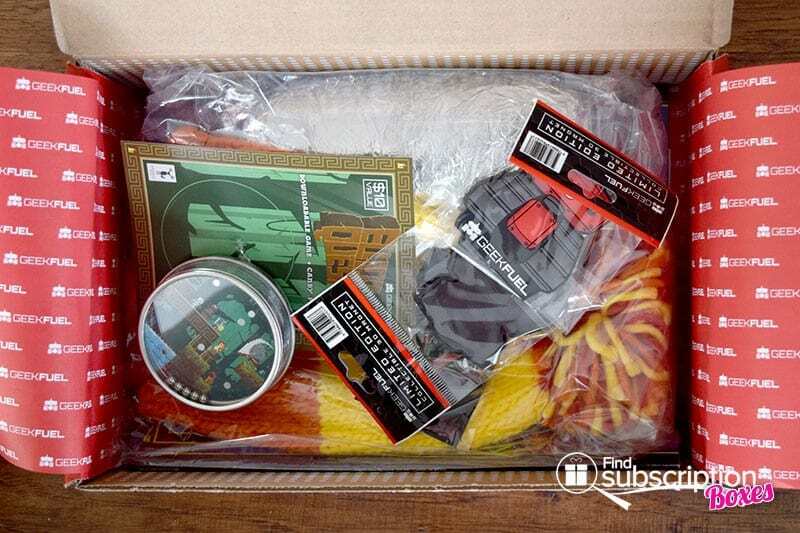 Geek Fuel is a monthly geek subscription box for geeks and gamers. Every Geek Fuel box includes an exclusive geek t-shirt, a downloadable Steam game and more geek goodies. 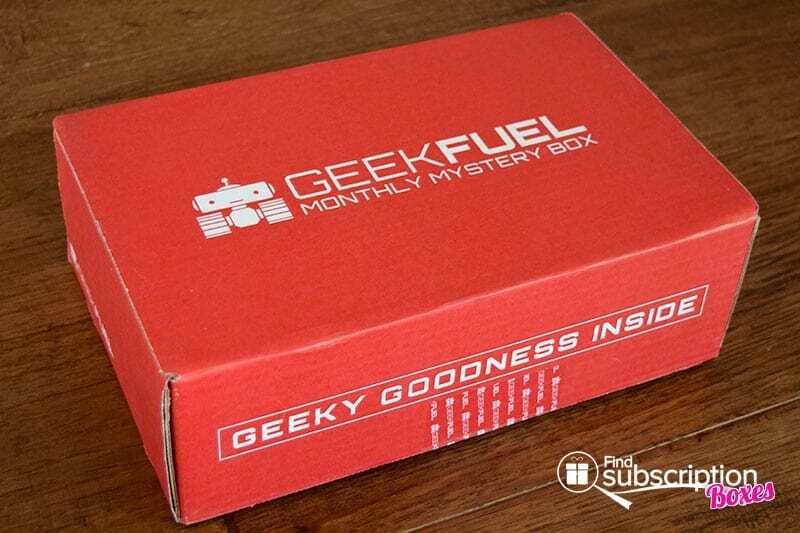 With today’s Geek Fuel review, we’re unboxing the February 2016 Geek Fuel box. 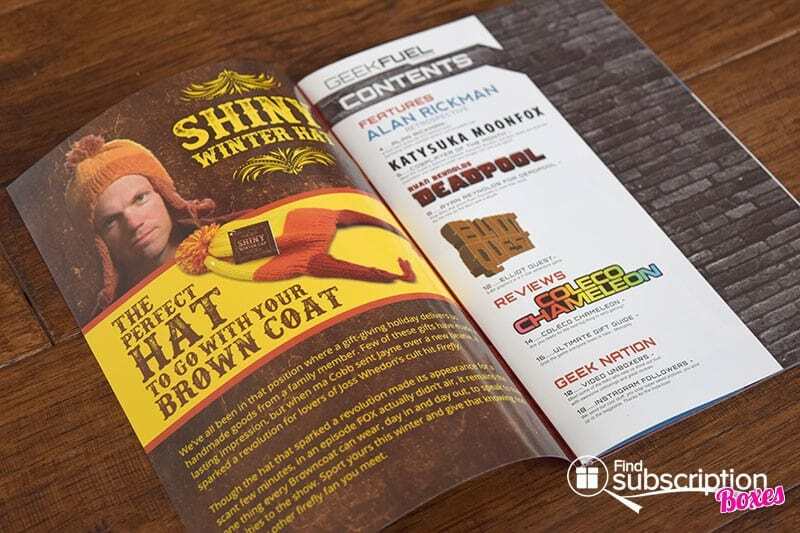 Geek Fuel includes a product description card and the monthly Geek Fuel Magazine in each box. This month’s magazine issue included articles honoring Alan Rickman and an ultimate gift guide for geeks. 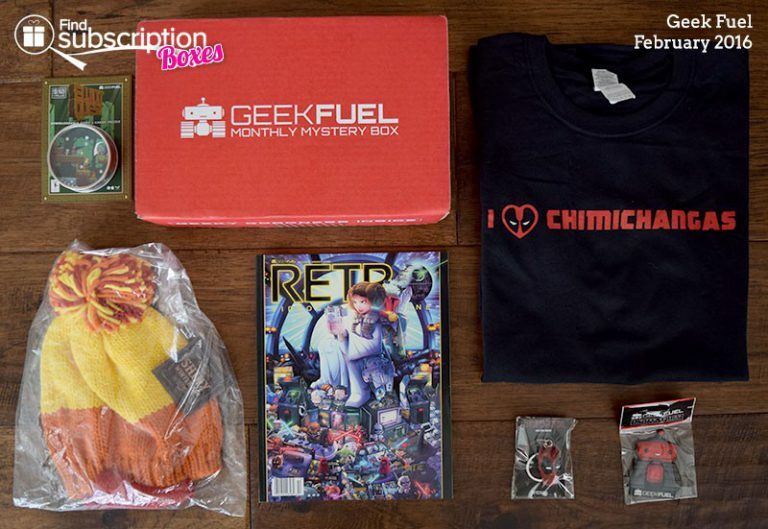 Here’s a first look inside our February Geek Fuel Box. There were 6 geek goodies in our Geek Fuel February 2016 geek box. The Merc with a Mouth loves his chimichangas and now you can too with this exclusive Deadpool t-shirt. Firefly Fans will recognize Jayne’s Shiny Winter Hat as a stylish way to stay warm. Enjoy a few sour candies as you help Elliot find a cure for his woes in this 8-bit adventure game. The latest issue of Retro Magazine features an exclusive Geek Fuel Variant Cover and a variety of video game articles and features. Deadpool fans received a Deadpool Keychain, Bottle Opener, or Pin Badge to show their support. Bring a little geek happiness to any metal surface with this 3D geek fuel magnet. With the Deadpool t-shirt and Jayne’s cozy Firefly hat, the February Geek Fuel box delivered some stylish geek fashion items. The Elliot Quest puzzle tin requres a steady hand and we look forward to trying the Elliot Quest game. Video game fans will love the February issue of Retro Magazine, which has a retrospective look at the best and worst Star Wars videogames and quick reads about upcoming games. What was your favorite Geek Fuel February 2016 geek item? Get a sneak peek into the Geek Fuel March 2016 box with this first box spoiler! 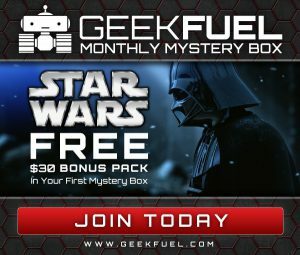 For a limited time, new Geek Fuel subscribers can get a free Star Wars item or Star Wars Gift Pack with new 3, 6 and 12 month Geek Fuel subscriptions. Subscribe now to claim your free geek gift. How would you rate Geek Fuel ?